At some point a video will hopefully become available. In the mean time, here is an account in words with pictures by the versatile Niklas Zimmer. Warming up. 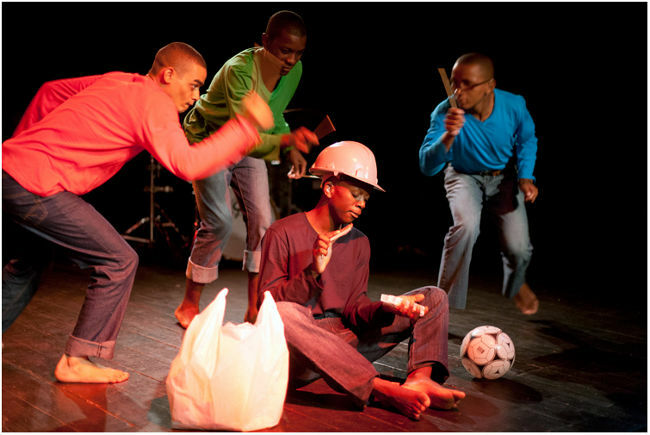 Apart from Lindokuhle (far right), they’ve all performed before as part of FTH:K’s theatre programme. But tonight’s performance is a little different. 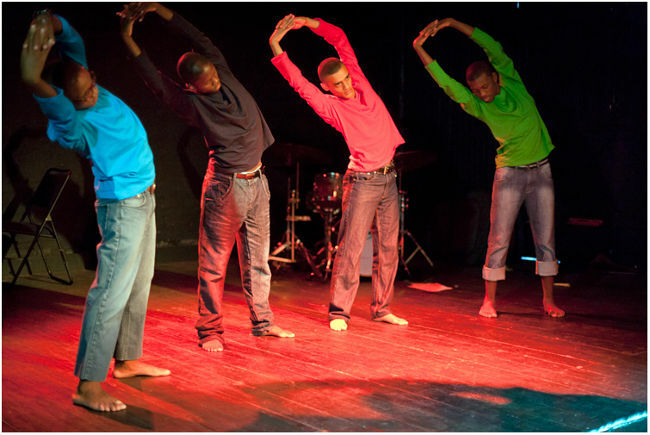 G Force are (from left): Simthembile Meetsheni, Nkqubela Jojo, Yazeed Moosa, Lindokuhle Shumani. Three men sit in a circle on one side playing a game with chopsticks – tapping each others sticks in a rhythmic cycle. A man arrives wearing a hard hat, carrying a plastic bag of groceries and a soccer ball. He sits down, takes out a pack of cards and starts shuffling them loudly. The three boys notice him, give each other a wink and creep up to the man. They whack him on the hat with their chopsticks and spring back out of reach. He’s pissed off but goes back to shuffling. They hit him again…and again, until he gets more and more pissed until…. he blows up. They all stand together and give three loud shouts, the last sustained. Then they stop. Freeze. Sit down. No hard feelings, hard hat man distributes small boxes of juice complete with fancy straws. They all imbibe with much relish and then start fiddling with their boxes, which then become… cell phones. Walking they circle and rant on their phones in a parody of irate (talking & hearing) business men. Then two start bouncing a ball and beckon for the others to join but they are too involved in their absurd phone calls. Eventually one, whilst talking, starts absent mindedly rummaging through the grocery bag where he finds a toy. It squeaks! He freaks and throws the toy which then becomes part of the ball game…. until the ball rolls, stopping at the feet of the remaining cell phone man. He stops, looks curiously at the ball and then has a brain wave. Cellphone aerial (straw) becomes ball blower. All four on floor now trying to move the ball around with puffs of air….. but eventually this becomes too frustrating and a blow up results – they stand and give three shouts, the last an extended wheeze. They freeze. Then sit down. Hard hat man distributes packets of potato crisps and they munch happily. Hard hat man also gets the audience to join in by distributing crisps to them. Everyone munching happily (audience perhaps a little cautiously). 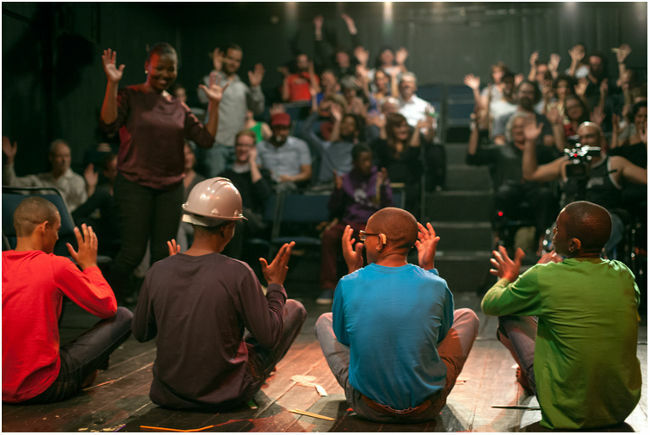 Hard hat man sits down then slumps down for a happy nap [in this performance he lay down on the squeeky toy!]. But the other men get mischievous and start dropping single crisps onto him… then gradually increase the amounts until….blow up! Man leaps up and the (by now expected) three shouts commence! Freeze. Then relax. And hard hat man rummages in bag and distributes chopsticks (disposable and in wrappers). 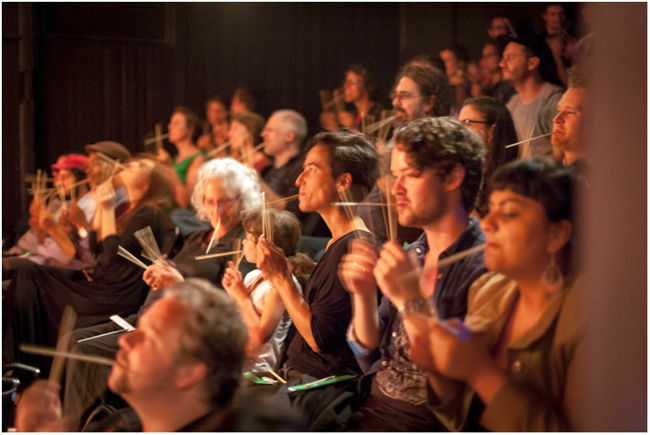 Click…click, cccclicck, as the audience breaks each chopstick pair apart. The men each insert one chopstick between their teeth and play it with a chopstick in each hand. The audience follow suit. Weird tapping chopstick music ensues until the performance is drawn to an end and the audience applaud. Finally G Force give their G Force cheer (four hands together in the SSL* symbol for the letter G) and I and our interpreter Betty, start facilitating questions and discussion. Many thanks again to Edge of Wrong (Now in its 11th year), especially Morten Minothi Kristiansen and Simen Skoe. 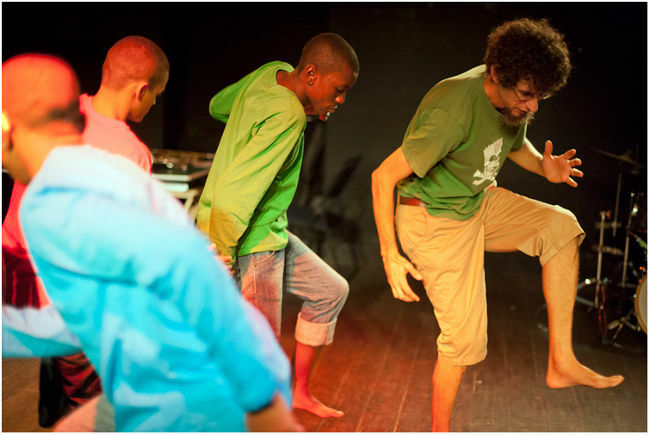 And Dominican School for the Deaf at Wittebome for generously allowing me to interact with their students as well as turn their school hall into a performance laboratory! « Normal Noise without Ears. And Marshmallows. Phenomenal art by Brendon Bussy and the G Force :-). An absolute treat to have the G Force perform on EDGE OF WRONG! Thanks allot again! a pleasure 🙂 G Force are very happy. And of course thank YOU!